Sherman and Denison are cities 75 miles north of Dallas, located in Grayson County just below the Texas-Oklahoma border. Named after a Texas Revolution hero, Sherman was incorporated in 1850 and started as a stop on the Butterfield Overland Mail route, a semi-weekly mail and passenger stage service that ran from St. Louis and Memphis across Texas to San Francisco. Eventually, it became a cotton growing community, which led to the development of such industries as milling and cottonseed oil production. Denison was formed years later, in 1872, when the Missouri-Kansas-Texas Railroad line came through town. In 1901, Sherman and Denison were connected with Texas’ first electric interurban railway, merging the two cities’ histories together. As the two cities blossomed, many Jews from St. Louis and other Northern cities came to settle in Sherman and Denison. When newspaper editor Charles Wessolowsky traveled through the area in 1879, he found about 100 Jews from 20 families in Sherman, which had a total population of 10,000 people. On his stop in Denison, he found just ten Jewish families. The American Israelite newspaper reported that 30 members formed Congregation Adath Israel in Sherman in 1879, though no mention of the group is found again in the historical record. In Sherman, Jews quickly moved to the forefront of the city’s economic and civic life. One of Wessolowsky’s first meetings was with William Levy, a former Confederate Army major from Altona, Germany. Describing Levy as “the well known vindicator of Judaism,” Wessolowsky praised him for his efforts to use “his able pen, learned and logical arguments, clear and distinct reasons [to] hurl back the slander and defamation and false accusations brought against the Jews and Judaism by some narrow-minded and bigoted man or men.” After the war, Levy opened a men’s clothing store in town and became involved in the larger Sherman community. He served as an alderman from 1873 to 1881 and 1883 to 1889. From 1881 to 1883, Levy served as mayor of Sherman. In 1890, he was asked to give the dedication address for an African American college in town. During his speech, Levy called on the town's black residents to emulate Jews by pursuing education. While perhaps condescending in tone, Levy's speech was progressive for its time. His son Jake Levy served as mayor from 1891 to 1893. Herman Kuhn was also a prominent Jew in the community, serving as editor of the Denison Evening Herald. In Sherman, Wessolowky noted that “the most extensive and largest business,” Schneider & Co. was run by a Jewish family. While Wessolowky observed that many Jews in Sherman and Denison were not particularly religious, they did form organizations centered around their faith. In 1879, Jews organized the Denison Hebrew Mutual Relief Association, whose purpose, according to its constitution, was to “aid the needy, care for the sick and bury the dead.” By 1887, it had 25 members, held monthly meetings, and had a board with L. Eppstein as its president, S. Weisman as its secretary and H. Casper as its treasurer. By 1900, it had shrunk to ten members with an annual income of $60; Henry Regensburger served as its president. By 1879, Sherman had a B’nai B’rith Lodge with E. Hernstadt as its president. Jewish sections in local cemeteries were also acquired in both Denison and Sherman, in 1878 and 1890 respectively. Despite this organizational activity, there seems to have been no active Jewish congregation in either city during the first half of the 20th century. During the late 19th century, the Jewish community was concentrated in retail trade. The 1887-1888 Denison City Directory shows a number of Jewish-owned stores clustered on Main Street. 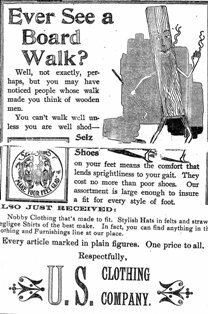 Levy Louis and L. Bernheim both had clothing stores, while J. Casper established a dry goods store. Joseph Weisman and Daniel Doppelmayer partnered together to open the Weisman & Co. clothing store, while Solomon Weisman worked as the store’s business manager. Brothers Henry and Elias Regensburger, immigrants from Germany, sold clothing, boots and shoes at their U.S. Clothing Company. Their establishment was open for many years, celebrating its 60th anniversary in October 1945. In addition to many businesses already mentioned, the 1899-1900 Denison City Directory also lists the Eppstein & Son store. Owned by Leopold Eppstein and his son Milton, the store sold wholesale liquors, wines, and cigars. Milton was also the proprietor of the Denison Opera House. Morris Emilstein, an 1876 immigrant from Russia, operated his own grocery business. Another notable Jew to live in Denison was Ray Karchmer. Fleeing persecution in their native Lithuania, then part of the Russian Empire, her family arrived in the United States through Galveston in 1907. After settling in Denison, her father, Kalman, became a junk dealer and was, according to his great-grandson, “the poorest man in Dension.” However, Ray successfully completed high school in 1909, graduating as valedictorian of her class. She earned a scholarship at the University of Texas Medical Branch in Galveston. Graduating in 1913, she was one of the first women – and Jews – to graduate from a Texas medical school. Her academic excellence garnered attention from the Galveston Daily News, which wrote that she was “a Russian maid who six years ago was unable to speak English, and who has completed eight years of scholastic work in six years.” Though she no longer lived in Denison, she went on to become a Jewish and female pioneer in the medical and other fields. She became a successful and renowned ophthalmologist and served 24 years on the Houston School Board. The Jewish population in both cities decreased as the years went on, with some 36 in Denison and 43 in Sherman in 1937. However, the establishment of the Perrin Air Force Base in Sherman in 1941 brought new Jews to the area. 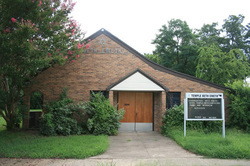 Sometime in the 1950s, a group of about 20 families from both cities came together to build a synagogue, known as Temple Beth Emeth, in Sherman. A member of the congregation, Irvin Suckle, who owned a scrap iron business, donated the property. A lay leader conducted services each Friday night, which one member remembers were led in about three-quarters English and one-quarter Hebrew and was “pretty much Reform.” By 1965, the congregation had joined the Reform Union of American Hebrew Congregations. Beth Emeth reached a peak of 32 members in the 1970s. In the 1940s and 50s, Jews in the area continued to concentrate in retail trade. After settling in Illinois, Austrian immigrants Louis and Esther Ringler came to Sherman in 1946 to pursue better business opportunities. There, they opened a women’s clothing store, The Cinderella Shop (later known as Ringler’s) and employed many local Jews. Milton Schwartz also owned a ladies clothing store. In Denison, the Label and Hartholtz families operated clothing stores while the Weingartens, coming from Austria, owned a millinery shop. Jack Gordon, a Holocaust survivor, opened a Western-wear store. Marks Brothers Department Store and Julie’s Dress Shop were other Jewish-owned businesses in the area. After the war, a handful of Jewish professionals began to settle in Sherman and Denison. For example, Sam Levine worked as a doctor in Denison. Unable to sell their businesses and with their children moving away, most Jewish merchants were forced to shut down their stores in the 1960s. The Perrin Air Force Base closed in 1970, which led to a decline in the area’s Jewish population. After over 40 years in business, Herman Ringler, the son of Louis and Esther, retired and sold Ringler’s Women’s Wear. It was the last downtown Jewish-owned store. Despite this decline, Jews continued to have a significant impact on the area. In the 1980s, brothers Bill and Morris Regensburger died leaving a foundation trust of $1 million to the city of Denison. With the railroad boom long gone and the air force base closed, the Sherman-Denison Jewish community has declined. Yet the nearby Austin College has helped attract Jews to the area. In 2009, the college selected Dr. Marjorie Hass as its president, she was both the first woman and Jew to serve in the position. Since the 1980s, Beth Emeth has sustained a decline in its already small membership. The congregation has also had to overcome anti-Semitism. In October 2009, the temple was broken into and vandalized. Its Torah scroll was stolen and never recovered. Recently, a congregation from McGehee, Arkansas donated their Torah to the Temple Beth Emeth congregation. Unlike the early Jewish settlers in Sherman and Denison, the remaining Jews in the area are committed to maintaining their religious traditions. In 2011, the congregation had 15 members, most of whom were fairly recent arrivals in the area. Despite their small numbers, the congregation is active, attracting 20 to 40 worshipers at its monthly services led by a part-time rabbi.